This steak fajita recipe is both easy and delicious. This simple marinade can be used on chicken as well. 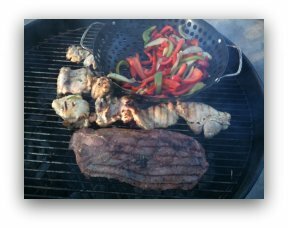 In fact, the evening we did this steak fajita recipe, we also grilled chicken. We used a skirt steak for the beef portion of the fajita, which is the cut of beef traditionally used in Mexico when making beef fajitas. This cut is on the underside of the cow, between the flank and the brisket. It is known for it's beefy flavor but can sometimes be grainy and tough. The solution is to either flash grill it on high heat, or let rest in a marinade for a few hours. For our fajitas, we did both. We made a citrus based marinade and let the meat sit in the marinade for 6 hours. The acidic citrus on the marinade tenderized the meat perfectly and added some nice flavor. Below is the marinade recipe. Feel free to doctor this marinade up to match your tastes. I always go easy on the salt because you can always add salt to the final dish, but you can never take salt away if you over-salted. If you have any questions about this recipe, click here to ask Dave personally. He will respond within 24 hours. The video below does a good job of showing how to grill the red and green bell peppers as well as the onions. It also discusses how to know when your steak reaches the correct temperature for your taste. It's worth watching. 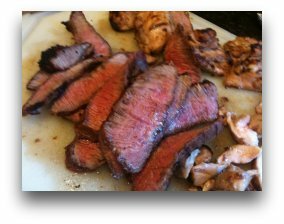 Every month or so, Dave sends out an email to members of The BBQ Gazette with special grilling tips and suggestions. Just enter your first name and email address below, and no worries, Dave doesn't share these email address with ANYONE!